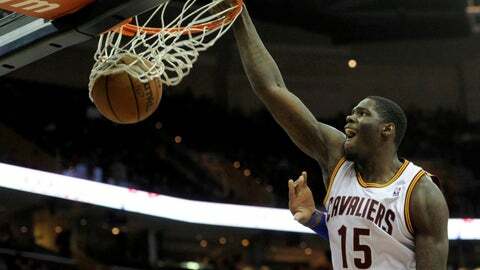 Cleveland Cavaliers small forward Anthony Bennett (15) dunks in the fourth quarter against the Detroit Pistons at Quicken Loans Arena. CLEVELAND — Something is seriously wrong with the Cleveland Cavaliers, but good luck trying to put your finger on it. Cavs coach Mike Brown usually points to a "lack of urgency," and that is spot on. But after Monday’s horrendous 115-92 loss to the visiting Detroit Pistons, you have to wonder if being urgent would do any good. You have to wonder if the Cavs even have the pieces. For most of Monday, they looked like Kyrie Irving (21 points, 7 assists) and a bunch of castoffs. Maybe that’s all the Cavs are — but most folks who follow this sport expected them to be so much more. "The way we’re defending, and some of our turnovers, I have no answer right now," Brown said. About the only thing we know about the Cavs is they are in their fourth straight season of suffering way too many blowout losses. They’re in their fourth straight season of losing home games they ought to win. And they’re in their fourth straight season of making fans walk away and shake their heads, and perhaps forget about this team and move on to something that makes sense. Right now, the Cavs (10-17) do not. They’ve changed coaches, turned over the roster, and can no longer be considered all that young. If nothing else, they’re old enough to know better, experienced enough to play harder. Yet we’ve read and heard this story before. It’s not one of glee, either. It’s frustrating, and something has to change. Maybe it will even take drastic measures, major roster upheaval. Or maybe Brown can find the answer by continuing to "keep moving pieces and searching," as he promised. Besides Irving and maybe Dion Waiters (who’s injured), it’s hard to point to a member of the Cavs and say, "He can be counted on EVERY night." No one shoots the ball well from the perimeter on a consistent basis. No one scores underneath like that, either. Tristan Thompson has some nice moments. Same with Andrew Bynum, C.J. Miles, Earl Clark and even forever-hustling rookie Matthew Dellavedova. Nor is there ever any doubt about the endless energy and effort from Anderson Varejao. But nice moments don’t make a powerhouse. They usually don’t even result in the playoffs. And the Cavs may not want to admit it publicly, but they have an issue at small forward. The further along we go, and the more we think the Cavs are about to take some positive steps — they revert back to the same old bad habits and maddening losses. It’s OK to lose. It’s not OK to repeat your mistakes over and over and over, until fans finally take aim and let their remotes fly through the television. Not long ago, the Cavs were scoring 110 points a game, playing with intensity and seeming to grasp the difference between a winning play and just going through the motions. Now? Everything is a mess. Fans and media are all over the place in their own assessments on talk radio and in social media: It’s the coach. It’s the players. Calm down everyone, everything will be just fine. None of those observations are wrong. None are right. The answers aren’t that easy. But the Cavs, from owner Dan Gilbert to the last guy on the bench, need to come up with some solutions soon. The Sacramento Kings haven’t had a winning season or made the playoffs in nearly a decade. The Cavs don’t want to become the Kings of the East. They’re not there yet, and we do have to remember the positive signs from a week ago. But something isn’t right here, and it’s not right at all. When it comes to the Cavs, that is all we know, and we’ve been saying it for too doggone long.